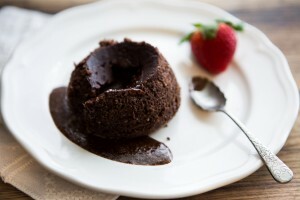 Looking for a Thermomix recipe to impress a hot date? 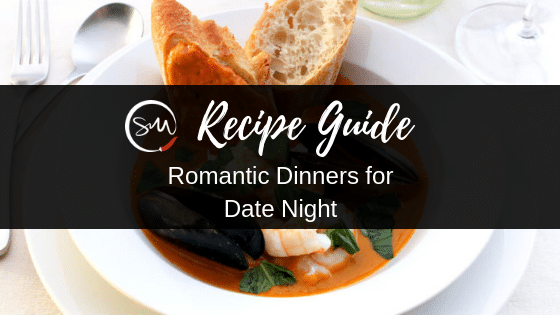 Here is a quick list of romantic dinners to cook for a special date night at home – i.e. Valentine’s Day that you may have forgotten about tomorrow! For a little bit of fun this menu guide will start with ‘quickie’ recipes and then have the ultimate ‘Taking Your Time to Impress’ recipes that take a little more effort and love. Looking for a restaurant quality dinner, faster than UberEats would arrive? These Thermomix recipes are a little bit fancy but fast. 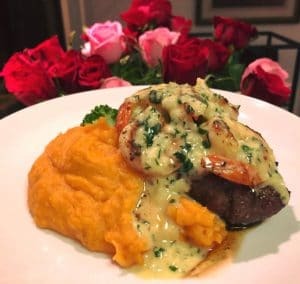 Now some people may want to avoid the extra garlic on a date night – but can you really go past some Creamy Garlic Prawns or even better a Surf ‘n’ Turf or Reef ‘n’ Beef? The delicious Creamy Garlic Sauce, prawns and steak team up perfectly with the Silky Sweet Potato Mash, green beans or even a simple green salad. Or if you are looking for something a little lighter, there is an All-in-One Dinner variation of the Creamy Garlic Prawns in The Healthy Mix III that cooks cauliflower rice with the meal. 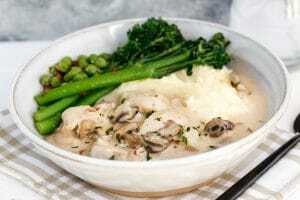 Not many Skinnies have discovered the under 25 minute dinner that is the Creamy Marsala Chicken from A Little Taste of Italy. Serve with your favourite mash, green beans pan-fried in a little butter and some crusty bread to devour the delicious sauce. Boronia Marsala should be available at your local bottle shop for around $10-12 and will keep in the cupboard for many meals to come. If you aren’t a lover of mushrooms, a little extra bacon and some green beans added towards the end will be a delicious variation. 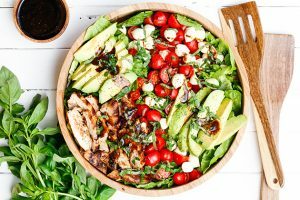 Although the chicken needs 8 hours minimum marinating time for maximum flavour, this impressive Chicken Caprese Salad can be made quickly before serving. You will absolutely make friends with this salad. Plus having a lighter salad can only be a good thing, if you are saving yourself for the main event or dessert. 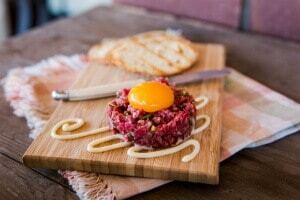 Steak Tartare – one of the quickest recipes to make! Feeling adventurous? If you know that your date enjoys a good quality rare steak, then you might want to make Steak Tartare as a starter or as part of a grazing platter. Serve the Sticky Szechuan Pork on top of the broth or with the rice. The Sticky Szechuan Pork Belly from A Little Taste of Asia is a big favourite in the community. Leave yourself a good 1hr 20 mins to prepare this dish and save time by asking your butcher to remove the rind from your pork belly. 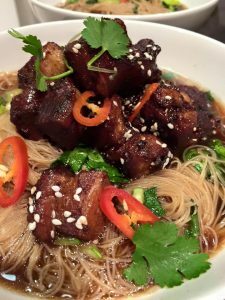 You may like to cook some sneaky crackle in the oven while the pork is steaming in the master stock broth – I like to season with a little Chinese 5 Spice. If you don’t eat pork, there has been success cooking this recipe with duck or beef, you just need a fattier cut of meat that will handle a longer cook. You can purchase Szechuan Peppercorns from your local Asian Supermarket or Grandma’s Pantry. If you can’t buy them I recommend choosing a different recipe. 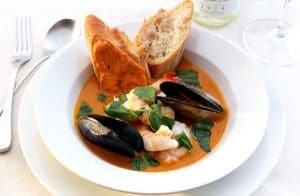 Nik considers the Seafood Bisque with Rouille to be one of the best recipes to come out of her kitchen… and for someone who doesn’t love seafood that is really saying something! Served with some crusty bread and any seafood lover will be in absolute heaven. Leave yourself plenty of time to prepare the seafood and debeard the mussels. If you have a little extra time on your hands, you could make the skinnymixer’s 5 Herb & Garlic Spelt Focaccia. 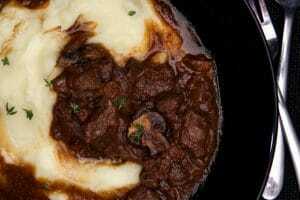 This deliciously rich Beef Bourguignon will definitely impress. After all isn’t French the language of love? Serve with your favourite mash and green beans, with a sneaky bottle of red wine on the side. If you need to make dinner earlier and reheat for your hot date – then this is the Thermomix Recipe for you! 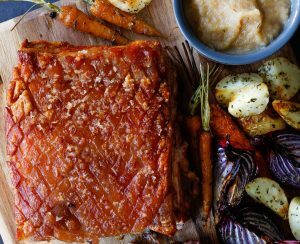 Although the Roast Pork Belly with Caramelised Apple Sauce takes a little longer to cook, there is very little actual active cooking time and is sooo simple. There is an all-in-one dinner version of this popular recipe in The Healthy Mix III which includes tips to get the best crackle. Please report back after your hot date and let us know how it went!